For your own reference, you can use this link to look up all posts tagged as the Top 2(00)9 of 2009. Hope you enjoy this as much as I did! :) Let's kick things off, shall we? #29. The Dolly Rockers - "Je Suis Une Dolly"
I first heard about this trio of cheeky chicas early in the year thanks to the always fabulous Paul over at FizzyPop, and I couldn't be happier that I did. Here is a group of girls who most certainly do not take themselves too seriously, calling their brand of fun "wonky pop" or "drunk disco". In a Girls Aloud free year complete with Sugababes on the verge of self-destruction (depending on who you talk to), I was keen to welcome new female Britpop group into my waiting and eager arms, and the Dolly's don't dissapoint. "Je Suis" is surprisingly bright, irreverant, funny and a toe-tapper to boot. Throw in their "feud" with my other favorite British five-piece, The Saturdays, and I'm there front row with popcorn. The real shame seems to be that the folks over in the UK don't embrace them as much as they should have. If they do, they might have a chance at taking a stab at underground America. Best Part: The handclappy backbeat, "flash our pants while we can-can", "looks more like a gah-den gnome", the sing-a-long chorus, and the accents (oh, the accents!). Other Songs of Note: "Golddigger"
Looking Ahead: The debut album plus third single "Boys Will Be Boys" are due in early 2010. #28. Ke$ha - "Tik Tok"
Where in the heck did Ke$ha even come from? She first emerged earlier in the year singing the Dead or Alive chorus sample for Mr. Flo Rida in "Right Round", but even then she was far too often compared with (dare I even say her name?) Katy Perry. Fast forward a few months and "Tik Tok" makes its debut around the 'nets under various titles, and three shots later and the song is being played on every Top 40 station and hits the Top 3 on the Hot 100. I don't know what the appeal is, perhaps its her remiscence to Lady Gaga with her candidness, but to me, that's about where the similarities end. Ke$ha is here to party, and again, doesn't take herself too seriously. Even if you dislike her, you gotta admit -- "Tik Tok" is pretty darn catchy, childhood fable rhyme and all. Time will only tell if she will be able to continue the momentum of her hard partying lifestyle (lyrically at least) and speeding bullet of a first single. She seems to be on the right track, opening for Calvin Harris over in the UK and co-writing songs for Miley Cyrus. Till time passes ("Tik Tok", get it? No? ), I'll be brushing my teef with a bottle o' Jack. Or something. Best Part: "Wake up in the morning feelin' like P.Diddy" (who doesn't? ), "kick him to the curb unless he looks like Mick Jagger", and "police shut us down...po po shut us down". Looking Ahead: The debut album is due out in January, and the supposed second single, "Blah Blah Blah" should be out any day now. #27. 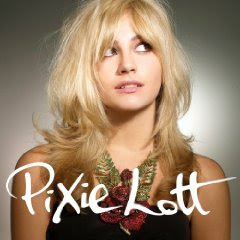 Pixie Lott - "Here We Go Again"
Victoria "Pixie" Lott was a welcomed entry into the UK pop stratosphere this year complete with two UK #1s, breaking through with the killer "Mama Do (Uh, Oh, Uh, Oh)" and a slot opening for my girls The Satz. While the pop blogging world eagerly anticipated her debut album, our thirst was satiated with a handful of leaks, the best in my eyes being "Here We Go Again" (produced by, who else, Mr. Red One, who will see plenty of entrances into this countdown, as you probably already guessed). It's a Red One cut without sounding like a Red One cut, relying less on synth and more on handclaps and vintage fun (but that omnipresent trademark "Red One...(insert artist's name here)" intro and background sting bing! still remains). It was the song I really wanted to be the second single -- and after hearing Turn It Up in its entirity, I still feel its one of the strongest songs on the record. Perhaps Mercury Records thought there was too many Red One records out at the time (and yeah, I guess there was), but I still think that bypassing this as a single seems kind of crazy. Best Part: The Red One intro, the dun-dun dun-dun dun-dun bing backslide, "I need my medicine, and the cure ain't Aspirin", "I'll be the last one on the dance-flo-oh-oh-oh", and the "I don't even care"/"No!" call and response bits. Other Songs of Note: "Mama Do", "Boys and Girls", "Jack"
Looking Ahead: This song being the fourth single...if Mercury knows what's good for them. #26. Kid Sister - "Right Hand Hi"
What is there to say about my fave rapper from the Chi that I haven't already said? "Hi" still sounds great months after I first discovered it, and the entire album Ultraviolet serves as the perfect soundtrack to my (somewhat infrequent...I really should get on that more) trips to the gym, as well as subway rides to work. I adore that she is so respected on the underground, but her sloth-like transfer to commercial success frustrates me more than a little bit, when we have more than our share of rent-a-rappers and ridiculous "hip hop" smoozings. This has to be one of the catchiest chorus I've heard on a hip-hop inspired track all year, but after the events of the VMA's, it's not exactly the best time to be a protege of Kanye West. Still -- quality music is quality music, and Kid Sis brings the funk, mixing hip hop with synth in a way that has never truly been outshone to my ears, 'cept maybe my her (occasionally egotistical) big bro in crime. 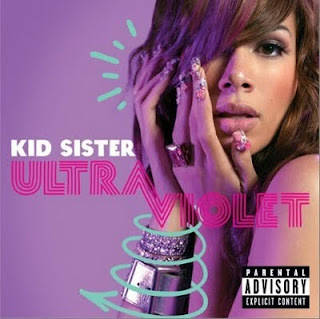 Best Part: "Hi, I'm Kid Sister-ah" chorus, that unrelenting beat, "Where you from? (SOUTH SIDE!) Where you from? (WEST SIDE!)" (mostly because I'm from the South/West side of Manhanttan...lame? Yeah, I know) and the ghetto Chi-Town accent. Looking Ahead: Fingers crossed for "Step" to be the second commercial single. Clue: The next four on the countdown include all men (but with some female featured singers). I have not been disappointed! I NEED MORE. LOL. That Ke$ha track isn't that bad for me but it isn't something I would put on my countdown either. Hurrah for Pixie! 29: Ahh! I love the Dolly Rockers, I first heard them on the Last.Fm app on my iPod. They're really good. Forget the Saturdays I think they've got new competition with Girls Can't Catch. 28: LOVE IT!!! Ke$ha's "Tik ToK" rocks my world she's actually brilliant. I saw her live performance on tv the other day and she's just so enthusiastic. I've heard snippets from her album on Ken's blog and it's sounding good so far. 27: I didn't like this at at first, but like most tracks this year it gew on me. Ke$ha is starting to pop up on people's countdowns, and that makes me wonder if I missed the memo. I just don't like her image/positioning, and maybe I am just taking that out on her music. To me, it just sounds like a blatant ripoff of GaGa's "Just Dance". Nikki - Yayyys! I'm glad you like it! :) I'm enjoying yours as well! Ke$ha seems to be somewhat polarizing. I don't know about her longtime career, but I love the song. Haha. J - I've yet to find a Girls Can't Catch song that I enjoy, mostly because all of what I have already heard feels too familiar. Once I hear something fresh, I'm sure I'll be on board. Oh, don't worry - more is coming!